Seattle beer week is quite the event. 10 days, countless events, and absolute ridiculous tap lists all around town. Out of all the events, one stood out in particular: Cantillon and Drie Fonteinen at Urban Family Public House. UFPH is a brewery in their own right, but they also are a distributor that is one of the few to bring Cantillon over from Belgium. They basically decided to blow their entire Belgian mega-torque on one night. Look at this Insta-Whale list: From Cantillon - Iris, Fou'Foune and Mamouche; From Drie Fonteinen - Hommage and Golden Doesjel. The Cantillons were all on tap for the event, the 3Fs were bottles. All were $9 for 6 oz glasses (which when considering the retail prices of some of these, is not a terrible deal). With the wife and a buddy we met in line during the hour wait to get in, we were able to get multiples of everything we wanted and tried all 5. So what did we think of them? The winner of the night was Mamouche. This is the most unique thing I've had in quite some time. Its a lambic made with Elder Flowers. The flowers give off an incredible dry and spicy note that is ball-tingling good. You get a little berry coming through, but its the floral notes that shine on this. Its a sour where the sour part is not the prime player, which is a nice change from fruity sours. Don't get me wrong, this is still mouth puckering sour, but those Elder flowers, hot damn. Second for me was Fou'Foune, for the others Hommage. Fou was a really nice, well balanced apricot sour. More sour than The Bruery's SitR (and Logsdon's Peche n Brett), less than Cascade's Apricot. More balanced than all three and drier as well (everything was actually quite dry and not cloying at all). A few people in the place said it was not as fruity as the times they had it in bottles. Still, fantastic. For me, Hommage had a formaldehyde smell to it that I couldn't get over. It contains a mix of cherries and raspberries, and the flavors are quite decadent (the formaldehyde is not on the taste, just the nose). The mouthfeel reminded me kind of like a melted raspberry sorbet. The bottom two were both new 'lambics', so they were less sour. The Golden Doesjel was much better than Iris. The difference is Iris is dry hopped whereas Doesjel is not. The Iris just tasted flat and not very sour. Kind of like a pale ale bretted up with no carb. I could go around town and probably pick up 20 sours better than it for less than $15, so kinda disappointing. The Doesjel is a perfectly crafted lambic. The only downside was it was done against Fou, Mamouche, and Hommage, and would have probably ranked higher with some type of adjunct like the others. Still, if in a bar, I would not hesitate to order it. From left, Hommage, Iris and Fou. Got too lazy for subsequent pics. Urban's Baby Cakes: brewed in honor of "Sir Nicholas Cage". I like this place already. Hey, I'm visiting Seattle this weekend... know where I might be able to find Cantillon on draft/bottles around town or bottles to take home? Or 3F Hommage? Unfortunately, I do not. The event was pretty much the only one like it I've seen. 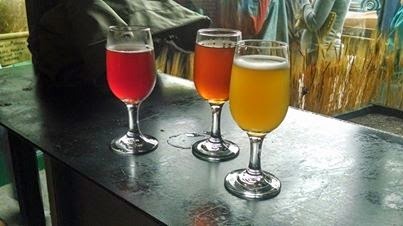 If you check the Seattle Beer Week website, there might be some other sour events.